NZSL Week Survey: Last Chance! We want to hear from each and every one of you, your thoughts and how you felt about NZSL Week. Your feedback is very important to us so please take 10 minutes of your time to complete this survey (also in NZSL video). This is your last chance to complete the survey before it closes next Monday! In the last newsletter we congratulated William Mager for being awarded the OBE for broadcasting in the UK. Unfortunately this was in error. Congratulations should have gone to Terry Reilly, who is in fact person being awarded the OBE for his fantastic work for Deaf broadcasting in the UK! William was the author of the linked article about Terry's award. Apologies from the editor of this newsletter. The Comm-Clear Launch events scheduled to happen in Auckland, Wellington, Christchurch and Hamilton have been temporarily postponed. All launch events will be rescheduled for a later date. Comm-Clear Management apologises for any inconvenience the postponement has caused. IHC is currently gathering recent examples of discrimination experienced by disabled children and their families at their local schools. This information will support the discrimination complaint IHC has filed with the Human Rights Review Tribunal. The survey will be confidential and any information will only be used by IHC staff. No information will be shared without your permission. IHC have not put a deadline on completing the family survey yet. IHC has also developed a survey for education professionals and others involved in the school lives of disabled children and young people. For example: teachers, teacher aides, Board of Trustee members, principals, therapists, etc. If you have questions or concerns you wish to discuss please call Director of Advocacy Trish Grant 04 495 2773 or email trish.grant@ihc.org.nz. Reminder: Northland Deaf Club this Saturday at Kensington Traven. Ticket: $32 adults, $27 under 12. It was organised for NZSL Week 2014, but postponed to 25th June. Now it’s coming soon. Deaf presenters will be talking! Alana, Kim, Angus and couple of others will be talking about Deaf topic, eg history, jokes and life. Interpreters Tania and Harri will be there. When: 25th June, entry 6.00pm, and presentation start at 6.30pm sharp. Where: Old Butter Factory, two ways in - one off Bank St and other next to Farmers carpark. $5 entry. Bring warm clothes. If raining, it will be postponed because it is outside. Choosing whether to study New Zealand Sign Language (NZSL) and possibly a career, is one of life’s biggest decisions. ADS wants to make the process easier by getting the experts under one roof to help you. This information evening provides you direct access to New Zealand Sign Language (NZSL) tutors and programme leaders, allowing you to get in-depth course information. The team from Auckland Deaf Society will be onsite to help you find the right information and how to start learning a new language! A NZSL interpreter will be present on the evening. For Further information or general enquiries, please contact the NZSL Tutors Co-ordinator, Victoria Lessing, by email at victoria@lesko.co.nz. Keen to Volunteer at ADS? If interested, please email Julie-Ann Taylor at ADS: events@auckland-deaf.org.nz. Access: Wheelchair friendly. Please let them know if you need any other assistance. Come together and talk about how your Human rights and your life has been over the past 5 years. The Brisbane Broncos travel to Auckland with a host of talented players such as Sam Thaiday, Justin Hodges as well as Kiwi players Josh Hoffman and Alex Glenn. They have also signed arguably the most exciting player in the NRL, Ben Barba. They will be out to prove a point after being beaten by the Vodafone Warriors by a large 56 – 18 margin. See if our boys can repeat their efforts from last year at Mount Smart Stadium in Round 15. The award-winning Hobsonville Point Farmers Market, a picturesque gastronomic destination for lovers of food and fine produce, draws visitors from all over Auckland and beyond. With activities and entertainment taking place alongside the market, and the option to make up a picnic from market produce or take a walk around Bomb Point, a trip to Hobsonville Point is also a great family day out. The market is held at The Landing, on the edge of Waitemata Harbour. The site was once the arrival and departure point for Sunderland and Catalina flying boats when Hobsonville Point was a Royal New Zealand Air Force base. Auckland Theatre Company (ATC) is proud to have been Auckland's flagship professional theatre company for over twenty years. Over this time ATC has been committed to making local live theatre accessible to all members of the community. We are now eager to extend this commitment to the members of the Deaf communities by offering NZSL interpreted performances of selected productions in our 2014 Acts of Faith Season. They will launch our Accessibility Programme with a NZSL interpreted performance of The Lion Foundation Season of Once on Chunuk Bair written by Maurice Shadbolt and directed by Ian Mune and Cameron Rhodes. Once on Chunuk Bair is a production of national significance about one day in the tragic Gallipoli campaign of 1915. It is an epic story of faith, courage and heroism. Dan Hanks will lead the sign interpreting team. There will be a pre show talk in NZSL about the story and clarification of the signs for names and locations. Sign interpreters will also be available pre-show at the bar to assist with bar orders or box office requests. Auckland Theatre Company is excited to present the pilot performance of the Accessibility Programme. We will offer free tickets to both Blind and Deaf patrons plus a companion to this performance. We welcome you to offer feedback after the show including thoughts about the experience as a whole and what we can improve in time for Jesus Christ Superstar in November. NZSL interpreted performance will be on Sunday 22nd June. Maidment Theatre, 8 Alfred Street, Auckland City. Pre-show talk for NZSL users will start from 3.15pm. The performance itself will start from 4pm. To book tickets ring 09 3093395 or email boxoffice@atc.co.nz. Tickets are limited, so book early. Check out this cool video from Rainbows End celebrating NZSL Week! Welcome, meeting start at 7pm. Confirm minutes from 18th April meeting. Matters arising from 18th April meeting. Tanya Hunter will explain about Comm-Clear meeting with Victoria Lessing and Tamina Kelly. New date for the meeting to be advised. Ideas/Activities for next get together on 18th July. Meeting to close at 9pm. See you all there and don’t forget to tell or bring your Deaf friends. They would love to see you there with new ideas and new faces. The Wiggles fame is founded on their all singing and dancing live concerts and the "Apples and Bananas" tour promises to be one of the best! The Apples and Bananas tour will feature songs from their new Apples and Bananas CD and DVD which is a new collection of nursery rhymes such as "This Old Man" and "The Wheels on the Bus" given The Wiggles magical music touch. Wiggles songs are a part of every child's life, and as their most recent CD and DVD hit number one success on the iTunes chart show (for Hot Potatoes, The Best of The Wiggles), the latest Wiggles hits such as "Do the Propeller" and "Simon Says" are just as popular as anything over their 23 year history. The "Apples and Bananas'" tour will feature these new hits as well as Wiggle classics such as "Hot Potato" and "Rock a Bye Your Bear". The Fab Four of fun will of course be joined by Dorothy the Dinosaur, Captain Feathersword, Wags the Dog and Henry the Octopus! 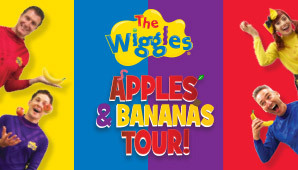 Get your tickets to The Wiggles "Apples and Bananas" tour as they'll sell like…hot potatoes! James Bichan, the manager from iSign was here at Deaf Aotearoa yesterday afternoon from Auckland to meet the Deaf Community. For those of you who were unable to come and would like to contact James, you could email him on manager@isign.co.nz. You could make a time to talk to him on Skype Video if that is your preference. Would you like to help clean up? Walk from Waiariki Street, Bayfair to Grove Avenue and pick up rubbish. $2 entry to be donated to Flower Fairy Musical. Find them on Facebook. The funds raised will go to the props, costumes and event costs. All entrants get a free Fruju iceblock from Tay Street shop. And McDonalds sponsor a free ice-cream with a purchase. Plus a cold orange drink at the end and flags for the event. Thanks to all. If weather not good, postpone to 21 June. Please check Facebook to find out if postponed. This Social Table Tennis Group is for all that enjoy the game. All abilities welcome to come along with paddles available. Mt Social Table Tennis plays all year round and the room has air conditioning in the summer and heaters for the winter so no excuses to get out and enjoy a social hit in a warm, friendly and fun environment. Contact Matt on 07 575 2048 or matthew.strange@bayleisure.co.nz. Nothing to do? Take a trip to Spring Street Car Park and have a look at the displayed cars. From 1-11 June 2015 New Plymouth's Stadium Taranaki will host five group matches and one round of 16 match of the FIFA U-20 World Cup New Zealand 2015. Visit www.fifau20.taranaki.info for more information. Come and join us for this FREE Boot It session as we bring 'Boot It' to Taranaki. This is a bootcamp style group exercise suitable for all levels of fitness. This free session is the kick-off for sessions starting 16 June with four locations around Taranaki that you can sign up for. The Taranaki Arts Trail 2014 involves 70 artists from throughout the Taranaki region opening their workshops, studios and galleries to the public over the weekend. The Taranaki Arts Trail is divided into smaller regional components to allow you to select the area and order in which to view. The New Plymouth Potters Inc has created a special market being held in our clubrooms in addition to opening our main gallery at the Te Henui Vicarage as part of the Taranaki Arts Trail Festival. You will find a large selection of uniquely crafted work by a number of our co-operative member potters who will also be available to meet and talk with you on the day. Prices are very reasonable. Sorry NO EFTPOS. Details: Sidu lives in a tropical paradise but he can't wait to break free! In the city he could have been the next Freddie Mercury but here he's just another rice monkey. A new resort promises life- changing riches and every village miser, entrepreneur, bride and priest is jostling for their slice of the dream. The great pretender finds himself torn between what's best for the future with what's right for now. 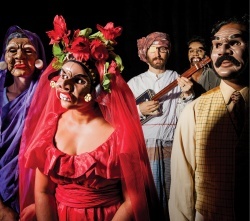 Under the skillful direction of Justin Lewis, they give puppetry and Balinese comic mask a riotous Indian Ink reinvention. Experience the theatrical magic, mischievous wit and artful storytelling that is vintage Indian Ink in a brand new show inspired by true events. Inglewood Primary School Celebrating NZSL Week! Mrs Evelyn Kennedy taught Room 13 at Inglewood Primary School the song “Don’t worry – be happy” in NZSL celebrating NZSL week and NZ music month. Dress up warm and come along to this popular Maori new year family celebration. There's singers, dancers, kapa haka, bands and a hip hop dance contest. Free kiddies rides and hot kiwi kai are on offer. The show ends with a fireworks extravaganza. We encourage those living within a kilometre to leave the car at home and walk to the park. We are grateful to our funders Trust House, Hastings Creative Communities, Te Puni Kokiri - Ministry of Maori Development and Ngati Kahungunu Iwi. Thank you also to our media sponsor Mai FM 105.5 for coming to support the biggest winter event in Hastings. Come along to the free Maori new year family celebration at the Napier Soundshell, Marine Parade. There's singers, dancers, kapa haka, bands and more. Free kiddies rides and hot kiwi kai are on offer. Walk through the maze of candle lanterns. Sky lanterns will float skywards to give thanks for the harvest and the upcoming 'new year' planting season. The show ends with a spectacular fireworks show to Maori and Pasifika music. We are grateful to our funders Te Puni Kokiri - Ministry of Maori Development, Infinity, Te Taiwhenua o Te Whanganui a Orotu and Ngati Kahungunu Iwi. Thank you also to our media sponsor Mai FM 105.5. Get your tweed on and on your bike for a fun ride around the pathways and street of Napier. Tweed is like an old fashion suit, jacket and pant that were worn many years ago. Ride starts at 10-30am on Rotary Pathway by National Aquarium, Marine Parade Napier. Stopping for lunch at West Quay Ahuriri and finishes at Masonic Emporium. Prizes for best dressed Lady, Man, Couple and Family. Free entry and open to any cyclist wearing tweed on a vintage or modern bike. Time: 7.30pm but games to start at 8.00pm no later! Bar will be open at 11.00 am, lunch will be served at 12.00pm. Go for a trip and help them celebrate their 25th anniversary 1989 - 2014. The AA Road service app is now available to download on iPhone, Android or Windows Phone 8. This is a free app, if you're a AA Personal, Business Care or Taxicare member you can request help at anytime and from anywhere in NZ from your mobile with this app. You need to download this app on your phone. Click that you are Deaf/Hearing Impaired. Use the GPS on your device to automatically send them your breakdown location. You will get status updates while they are processing your call out. There is a handy emergency torch function that uses your cameras flash if you are stuck in the dark. There is a FIXiT app that can be downloaded on your Smartphone called FIXiT PNCC, this app lets the council know about issues around the city that the council need to fix. This app is free to download, you take a photo, tag the location on the map where the problem is and then type what the problem is, this is then sent to the Councils Contact Centre. They will log this in their system and you will receive an email confirming your request has been received by the council. Some examples of what may need to be fix are street lights that are not working, pot holes in the road, graffiti, leaf litter, rubbish litter etc. The council needs our help to let them know what needs to be done so if you see anything that the council needs to fix this app will send all the information they need for them to action. Those of you who dont have a smart phone can still contact the council by email info@pncc.govt.nz, through their service request form on www.pncc.govt.nz or by using the relay you can call them 24 hours anytime on 06 356 8199. It is with great regret that Tamina Kelly, Director of Comm-Clear informs you the Comm-Clear Launch events scheduled for New Zealand have been temporarily postponed. All launch events will be rescheduled at a later date. Comm-Clear Management apologises for any inconvenience the postponement has caused. They hope that you will continue to support Comm-Clear even though this decision to postpone has been made. Thank you for your understanding and continuing support in Comm-Clear. Deaf Deaf World is an event set up to stimulate ‘real-life’ but in sign language only. It is an opportunity for hearing people to be fully immersed in a world of sign language, and face similar barriers that Deaf people might have in society. It provides a great opportunity to practise NZSL. This is a fundraiser event to support two Wellingtonian Deaf people, Candice and Zoe in their attendance to World Federation Deaf Youth Section’s Deaf Youth Camp in August in Washington, DC, USA. There will also be stalls selling knitted items, bracelets, baking and a raffle. Where: Wellington Deaf Society clubroom, 32 Marion Street, Wellington. Bring: Cash, the bar will be open and there will be things for you to buy. Please come along and support Candice and Zoe, attached is a flier of this event. Have you ever wondered how to tell an interpreter that you didn’t understand some of their signing? Have you wanted to give constructive feedback but worried they’ll be offended? Have you ever wanted to ask a Deaf person to slow down but worry what they will think of your skills if you do so? Have you ever wanted more time to debrief with Deaf generally about working together? Facilitated by Candice David and Wenda Walton. Bring a plate to share. Come along and let’s talk. CZDRU is having their Annual General Meeting and after this, there will be a prizegiving event afterwards to acknowledge their players efforts, please come along and show your support. Enjoy an introduction to the current exhibition Seung Yui Oh: MOAMOA, A Decade in NZSL. This tour will be given by Theresa Cooper, a member of the local Deaf community. Bookings are required, please email citygalleryevents@wmt.org.nz if you wish to attend. Please see attached registration form if you wish to attend. Wellington Association for Deaf Children committee has agreed to sponsor any of their families who want to attend the lunch and conference on Saturday afternoon (starting at 12:30) or the AGM on Sunday morning. WADC is holding its Annual General Meeting (AGM) but really this is just an excuse to get together! Afternoon tea will be provided so please just bring yourselves… They would love to see you and are also always looking for people to join the WADC committee. They meet monthly (1-2 hours on a Tuesday/Thursday evening) but outside this, the main commitment is just organizing 1-2 social events each per year. Contact WADC if you are interested or have questions by phoning the Secretary at 04 938 0173, or email wn.association.deaf.children@gmail.com. Get together and catch up also NZSL practice group at Nelson Suburban Club at 168 Tahunanui Drive, Nelson at 6pm changed to be once a month. We are having our Mid-Winter Christmas lunch at Hangar58. Please arrive at 11am for a drink and catch up. The cost of the lunch varies from $10.00-$28.00. There is a visitor coming from the North Island to join us for lunch, we hope to see you there. Let Rachel the secretary know if you require transport. After the lunch there is a table booked at the Suburban club. Raffle starts at 4.30pm then catch up and watch the Rugby game Crusaders VS Hurricanes at 7.35pm.All welcome to join. When: Tuesday’s 2pm-3pm, date to be confirmed. A evening of an auction fundraising to raise funds for our Deaf Youth members, two Wellingtionians Zoe Ferguson & Candice David and a Aucklander Jemma Matthewson to attend third WFDYS Children Camp at Gallaudent Univesity in Washington, DC, America. Please come and join the auction fundraising to support them. A topic is “Men’s Shedz Club” – it is to have another opportunity for the men to get together to talk about what they saw at Halswell and come to the meeting to share their experiences and to explore more ideas and how to do this collaboratively. Bring your friends, your own wool, knitting needs or other crafts that you wish to finish off. Later this year, work is scheduled to begin on an exciting new development at Christchurch Hospital – a brand-new Acute Service building. It is a part of the $650 million government investment in Christchurch’s hospitals announced last year. This will be the largest healthcare building project in New Zealand’s history. Please take the opportunity to join them to find out more about the future of your health system. New Zealand Sign Language interpreter provided to be confirmed (TBC). The Creative Space Ōtautahi Christchurch Project is looking for people to help them with the enquiries at how taking part in creative arts to help people to increase who have experienced mental illness. Our February 2011 earthquake have impact our well being in our communities has been enormous, but its earthquake have give us the opportunity for a ‘blank canvas’ where we can take a fresh approach to community arts. They would like you to help their project by answering their questions (provided in the flyer attached) as they want to find out about the experience of people with mental illness accessing to art programmes, all kinds of arts, eg craft, painting, weaving, jewellery, carving, sculpture, theatre, dancing, kapa haka, poetry and music. They would like see the feedbacks from our Deaf community – it would be appreciate from you. If you would like to assist with the questions, your local Community Relations Officer, Victoria is happy to support you – please contact victoria.walters@deaf.org.nz or text 021 324 828 or your can direct contact Kim Morton with your feedback. A hearing guy is looking for a Deaf member who would be interested to teach him NZSL. In return he can help with computers generally, or web technology specifically (he is a co-funder of a web company). Ideally, he would also like to flat or board with Deaf people who have NZSL as their third language. If you are interested, please email Morris John at cdrcat@gmail.com or text 021 923 001. Deaf Social night Friday 13th June is cancelled. The date for the Midwinter Christmas Dinner has had to be changed to the 12th July due to circumstances beyond our control. Come and learn about the Otago Rescue Helicopter and how it does much more than provide emergency medical assistance. Contact Fi at the office to let her know if you are coming. Michelle will be unavailable for appointments on the 17th and 18th of July. You can craft your own cupcakes and Cadbury products are incorporated into the hot drinks. I encourage people who are in their own homes and have Community Service Cards to look into getting your home insulated and ready for the cold months. With the Healthy Homes Schemes you could be eligible to get insulated at a lower cost. Those who are in rented properties may be eligible too. Your landlord would be responsible for paying for the cost. It can make a huge difference to your health and lower your power bills. If you would like to explore this further come in and have chat to Rebecca. Fiona has now given me some copies of the Dunedin NZSL Week Celebration photos. For those who want some copies, email Rebecca and she will send some through. I will have some printed to view at the coffee group. What is this? An opportunity for individuals involved in the Disability sector to gain new skills, information and contacts to help navigate this new path we walk! Who can attend? Family/Whanau carers who are in a unpaid caring role for an individual with a disability.